No good deed goes unpunished. 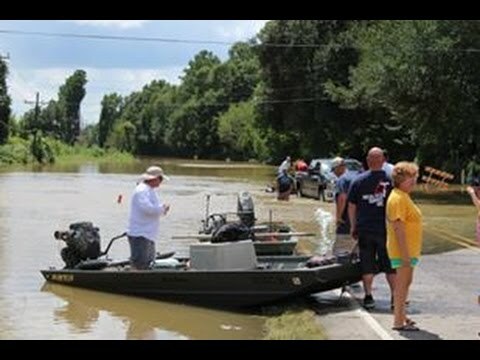 The Cajun Navy is a group of volunteers that operates at its own expense to rescue people trapped in flooded areas in Louisiana. They use their own boats. They risk their lives. And now that people have noticed that they are far more effective than government rescue efforts, there are plans to require them to pay a fee before they are allowed to do any good. “Don’t worry. It’s just a small fee,” legislators explain. “Maybe only fifty dollars. That would be worth it to put authority behind the Cajun Navy, wouldn’t it?” Worth it to whom? Who gains? Not the people needing to be rescued. Not the people wanting to help. What’s it for? In the video below, State Senator Jonathan Perry explains. Because some of the Cajun Navy volunteers had been turned away and not allowed to help with the rescue effort, State Senator Jonathan Perry is suggesting that setting up a state-sponsored program to train and license volunteers would enable the Cajun Navy to have more authority. A small fee would naturally be required to pay for the training and licensing. It appears that the entire motivation stems from the State being concerned about “liability.” The training isn’t designed to make the volunteers more effective rescuers. It is designed to reduce “liability.” The Cajun Navy volunteers have been boating all their lives. Their natural training far exceeds any that a state bureaucrat could give them. But the excuse for less experienced government workers to have the authority to train, test, and license volunteers is that otherwise the State of Louisiana might incur liability due to the acts of volunteers. “Couldn’t the volunteers just sign a waiver?” someone suggests. But apparently that would not be good enough. The authority of the State needs to assert itself. Volunteer rescue operations have been meeting with government opposition in Louisiana since the War of 1812. When the famed smuggler Jean Laffite informed State Senator Blancque that the British were planning to attack, Governor Claiborne shared this information with Commodore Patterson, who promptly sent the Navy to attack Laffite’s base and confiscate his ships. When later, General Jackson had no gunpowder flints to fight the Battle of New Orleans, it was Jean Laffite who provided the gunpowder and flints from his own stores and the artillerymen to man the guns. All this was done free of charge, but how did the government repay Laffite afterwards? They sold his ships at auction and gave the money to Commodore Patterson. When Laffite wrote to President Madison seeking redress, no help came from that quarter, either. Should modern day volunteers like the Cajun Navy be subjected to the same kind of treatment as Jean Laffite met at the hands of the government in his day? Hell no! If the government cannot keep up with rescue efforts by citizens, it should just stand aside and let them do what they do. There is a French term for this. It’s called Laissez-faire!